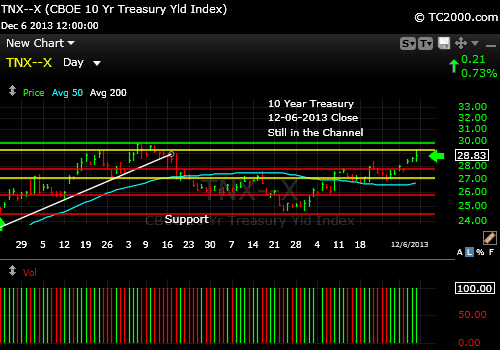 Market Timing Brief for the 10 Year Treasury Note Yield (TNX) Close on 12-06-2013: Will Rates Push Up to 3% Again Soon? The 10 Year Treasury yield tested the top of the yellow channel we’ve been following for months and failed to go further. Despite this failure at resistance, the yield trend is still UP until proven otherwise. This should have pressured interest rate sensitive stocks at the end of last week, but instead they moved up. Find out what I’ve been buying on my Twitter feed, which always has the most up to date info during the week. This rate game could shift quickly if the Fed surprises the market with a QE reduction in December. Most are not expecting it until perhaps March of next year. I can’t see it happening prior to Christmas. The Fed would be shooting itself in the foot. Rates locked in a range, but tested the upper end. Will they rise further and break through?